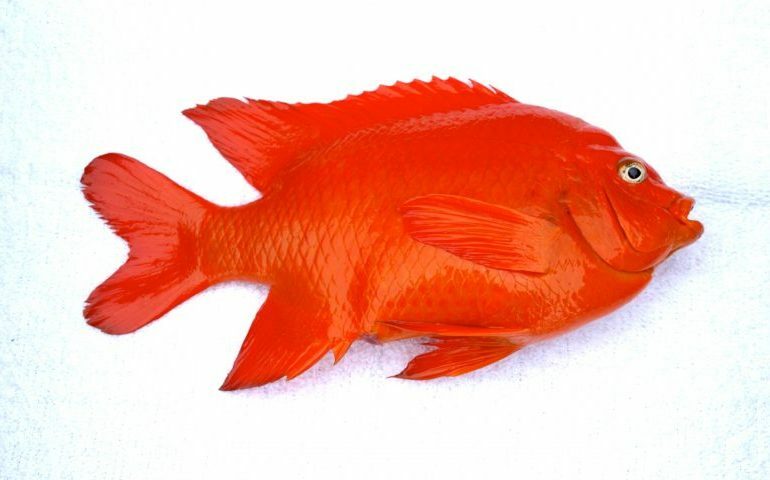 Arguably the most striking fish you’ll ever encounter is the Garibaldi. It’s bright-orange colorway stands out in the briny depths like a blazing traffic cone. Photo courtesy pierfishing.com. It’s a…special place full of…special people. In case you weren’t aware, lead is harmful. Good ‘ol Pb has all manner of damaging effects to humans, and for this reason, it has been banned in most household goods, including paint. Reasonably intelligent people are aware of this. Tragically, in a trend started in the 1990s, many Americans proved themselves not to be reasonably intelligent. Starting with the famous 1992 lawsuit where an Albuquerque woman sued McDonald’s for spilling hot coffee on her lap, we’ve lived in an overly-litigated society. California has led the charge with frivolous lawsuits, narrowly beating out Florida (naturally) as the fourth-worst state in a ranking by the American Legislative Exchange Council. The ALEC uses a complicated metric that basically measures (1) how likely a company is to be sued over something stupid and (2) how likely the court system in that state is to treat the case fairly. Only Illinois, Missouri, and Louisiana are better stomping grounds for people looking to capitalize on their own stupidity for a payday. But it was arguably prior to that 1992 lawsuit that California set the stage for stupid people to thrive. Six years before that first, famous, frivolous lawsuit, California decided to “protect” its citizens by requiring labels on potentially hazardous chemicals. It’s 1986, Proposition 65, also known as the Safe Drinking Water and Toxic Enforcement Act, started with the best of intentions, began asking companies to label hazardous chemicals. Essentially, businesses selling products in the State of California must provide “clear and reasonable warnings” to their would-be customers if they sell a product with significant risk of causing cancer, birth defects, or other reproductive harm based on historical records. What is significant risk? Well if that compound is linked to one additional case of cancer in 100,000 people over a 70-year lifetime, California considers that “significant risk”. There are similar standards for reproductive harm. Companies have some freedom in how they do this, but labels seem to work best. This is phenomenal, in theory, but in practice it means more than 800 chemicals now require products to have the “Warning: this product contains a chemical known to the state of California to cause cancer, birth defects, and other reproductive harm” disclaimer. Since California is the largest economy within the United States, that effectively guarantees all products with those chemicals will bear that label, allowing non-Californians to balk. 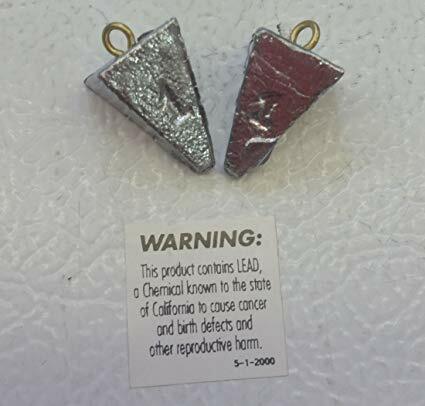 So next time you buy those sinkers, thank the Californian lawmakers of the 1980s for keeping you from making a sandwich after organizing your lead sinker collection. God knows you certainly would have done so without government direction from the all-knowing State of California. California has put a lot of stupid laws on the books. Some of the laws, though viewed as dumb by many, can at least make a case for their existence. Take for instance the ban on plastic bags. California started this trend Stateside in the summer of 2014. It makes sense and helps the environment, but it led to the wholesale use of paper bags — arguably the worst idea in human history since people first learned not to use poison oak as toilet paper. Banning plastic bags? Good. Encouraging paper bags rather than creating environmentally-friendly plastic bags from seaweed? Bad. It’s this sort of “Problem Identification Without Solution Identification” mindset that Californians must deal with on a daily basis. – Animals are banned from mating publicly within 1,500 feet of a tavern, school, or place of worship. Sorry kids, you’ll have to stick to the Discovery Channel to witness this sort of thing in the Golden State. – Bathhouses are illegal. You want to bathe in public? Stick to your local gym or Walmart late at night. – Peacocks have the right-of-way in Arcadia. – You can’t wear cowboy boots unless you own cows in Blythe. – In Carmel, you can’t eat ice cream on the sidewalk. Men cannot mix suit separates; their pants and jacket must match. Women can’t wear high heels within the city limits. Applying for a job with their police force will literally make you a part of the actual Fashion Police. Perhaps one of the stupidest laws on the books is the emotionally-charged law that makes Garibaldi, California’s State Fish, protected. 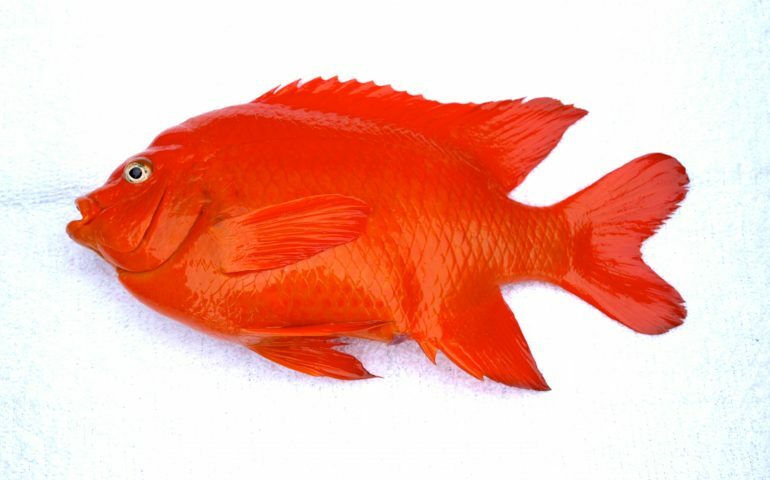 According to the IUCN Red List, Garibaldi are a “Species of Least Concern,” meaning there is no reason to protect them. Yet California, in its infinite wisdom, protects them anyway. Granted, there was a time when they were protected because of over-collection for use in the aquarium trade because of their high aesthetic value and relative ease of capture (they’re bright orange, after all), but their stocks have long since recovered. I’m a strong advocate for catch-and-release fishing, but the recreational harvest of fish should be allowed if the population is healthy. So even though Garibaldi are numerous in Southern California, especially in and around rocks, you cannot even intentionally target them. My own Garibaldi was incidental, but at more than two pounds, it would have filled the vacant IGFA All-Tackle World Record — if it hadn’t been captured in California. In fact, when I landed the fish, I couldn’t even get a picture because some tourist overhead was harassing me about catching a long Garibaldi. “You’re not gonna keep that are you?” he said. Of course not, buddy. I wouldn’t keep fish anyway, but just the fact that you can’t pose for a picture with one is proof that California is a sad, broken place. Keep up the good work #4. Read the next entry in #SpeciesQuest here: Species #106 — Chum Salmon.